Hy-Vee is proud to sponsor the annual matchup between the University of Iowa and University of Nebraska football teams – a Big Ten Conference rivalry that has been dubbed “The Heroes Game.” This yearly rivalry benefits the American Red Cross, an organization doing incredible good across the Midwest in times of crisis. The Heroes Game, scheduled for the Friday after Thanksgiving each year, pits conference powerhouses Iowa and Nebraska against each other in what has become an epic battle for bragging rights in the Heartland. The two teams will be playing for more than a trophy, however; with the help of Hy-Vee, they will use the national stage created by the game to recognize individuals for acts of heroism in their communities. When the Iowa Hawkeyes and the Nebraska Cornhuskers meet in Memorial Stadium on Friday, Nov. 29, for the ninth annual Hy-Vee Heroes Game, there will be more than bragging rights at stake. 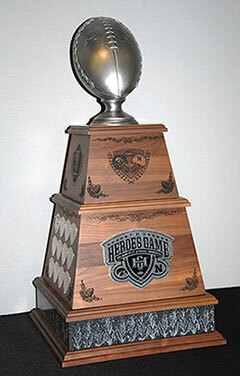 The game will determine which team takes home the coveted Hy-Vee Heroes Game trophy, which currently resides in Iowa City after last year's 31-28 Iowa victory at home. In anticipation of the 2019 rematch, Hy-Vee stores in Iowa and Nebraska are hosting a Hy-Vee Heroes Game Replica Trophy Tour in November 2019. A replica of the Hy-Vee Heroes trophy will be on display at a different Hy-Vee store each day, where customers also will have the opportunity to register to win four tickets to the game. The trophy will be on display at each store from 10 a.m. to 6 p.m. Check with your local Hy-Vee store to see if they will be hosting the trophy this year. In advance of the game, fans of each school are encouraged to nominate everyday citizens of Iowa and Nebraska who have performed extraordinary acts of heroism. One citizen-hero from each state will be invited to attend the game as a special guest of the teams, receive on-field recognition, and have his or her name inscribed on the game trophy. In addition, school officials are counting on the intense interest in the big game to help raise money for the American Red Cross as they continue doing heroic work in the two states. Hy-Vee stores in Iowa and Nebraska will spearhead the fundraising effort by creating activities designed to engage and excite fans of each school.